- Perfect fit and color uniformity. - Maximum safety in the results. - Total coverage of gray hair. It interferes with the total respect of the hair due to the absence of ammonia content. Shades available in 45 shades for stunning fashion divided in the natural, ASH, GOLD, COPPER, RED MAHOGANY, PURPLE, CHOCOLATE, SUPERLIGHTENERS. 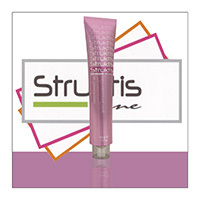 method of use : coloring cream STRUKTIS ZERO should be used in dilution 1 +1.5.